What Are Heartworms and How Do Dogs Get Them? your own back yard, it's still at risk for exposure to deadly heartworm disease. can eventually lead to heart failure and death. HEARTGARD Plus is highly effective in preventing heartworms. 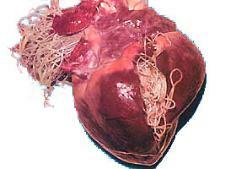 tiny worms develop into larvae (the infective stage of heartworms) within the mosquito. Without the use of a heartworm preventive, the heartworm life cycle will continue.